The Trail of History in Delano Park is a pedestrian sidewalk connecting the east and west ends of the park from 4th Avenue to Somerville Road. 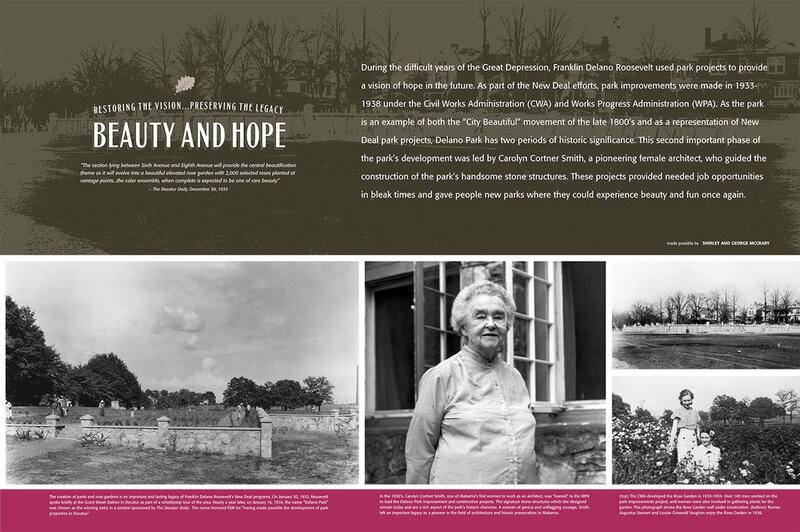 Educational interpretive signage is placed along the trail which tells the story of Decatur and Delano Park. During trail and signage construction, new park benches, trash receptacles, trees and sod were installed to enhance the trail experience. Organized on January 11, 1887, the leaders of the Decatur Land Improvement and Furnace Company envisioned New Decatur, later renamed Albany, as a planned industrial city and the “Chicago of the South.” The river and railroad provided important transportation links and helped to attract many new industries to the Decaturs. 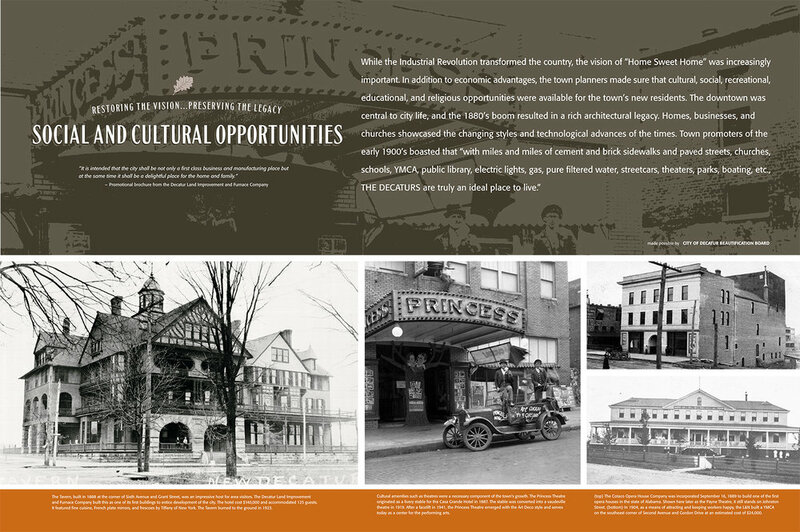 New homes, schools, churches, and businesses were established during this boom period in which the population grew from 1,200 to 5,000 people in a one year period. Quality schools were vital in attracting new residents, and leaders of the land company promised “public schools as good as any in the state.” In 1889, Gordon School was named in honor of Major E.C. Gordon, the leader of the land company. Other prominent leaders of the land company were C.C. Harris and W.W. Littlejohn. Both had served during the Civil War and were involved in reestablishing banking in Decatur in the postwar era. Though Gordon would not remain in the area after the second yellow fever epidemic, Harris and Littlejohn remained and were active in many areas of civic life. 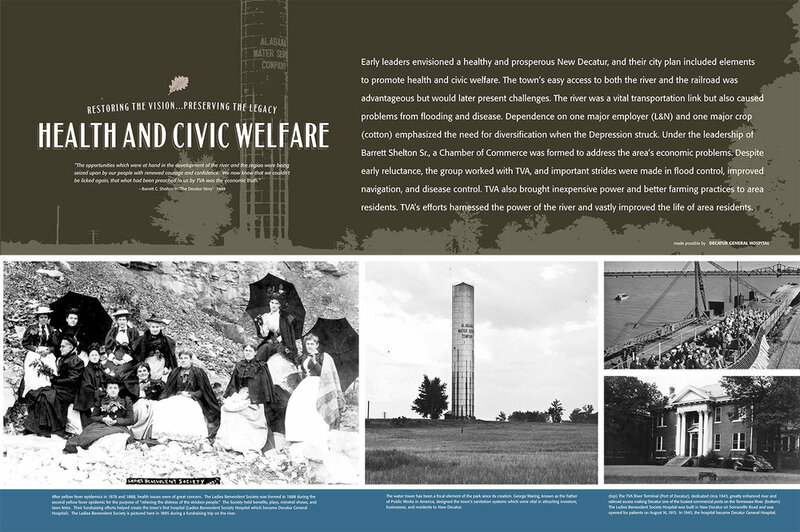 Early leaders envisioned a healthy and prosperous New Decatur, and their city plan included elements to promote health and civic welfare. The town’s easy access to both the river and the railroad was advantageous but would later present challenges. The river was a vital transportation link but also caused problems from flooding and disease. Dependence on one major employer (L&N) and one major crop (cotton) emphasized the need for diversification when the Depression struck. Under the leadership of Barrett Shelton Sr., a Chamber of Commerce was formed to address the area’s economic problems. Despite early reluctance, the group worked with TVA, and important strides were made in flood control, improved navigation, and disease control. TVA also brought inexpensive power and better farming practices to area residents. TVA’s efforts harnessed the power of the river and vastly improved the life of area residents. During the difficult years of the Great Depression, Franklin Delano Roosevelt used park projects to provide a vision of hope in the future. As part of the New Deal efforts, park improvements were made in 1933-1938 under the Civil Works Administration (CWA) and Works Progress Administration (WPA). As the park is an example of both the “City Beautiful” movement of the late 1800’s and as a representation of New Deal park projects, Delano Park has two periods of historic significance. This second important phase of the park’s development was led by Carolyn Cortner Smith, a pioneering female architect, who guided the construction of the park’s handsome stone structures. These projects provided needed job opportunities in bleak times and gave people new parks where they could experience beauty and fun once again. On February 4, 1927, the vision of a unified Decatur was finally realized when a merger bill officially joined Decatur and Albany. Delano Park has always served as a unifying link between the neighborhoods, schools, churches, businesses, and industries in Decatur. The park’s location near important transportation routes was intentionally planned to provide a tranquil setting in the heart of the city that would be accessible to all. From its beginnings in 1887, Delano Park was created by people of vision who saw the potential for greatness in Decatur. Through a public-private partnership between the City of Decatur and Friends of Delano Park, the town’s oldest planned park will continue to serve as a special place where people of all ages and backgrounds are united in a shared common ground. Delano Park was created with the democratic vision of a space that provides recreation and refreshment for all. As part of the “City Beautiful” movement of the late 19th century, parks and greenspaces were important components of sound civic planning. Early known recreational uses of the park include a nine hole golf course and tennis courts. New public facilities added during the 1930’s included a playground, wading pool, bandstand (gazebo), dance pavilion, and picnic shelters. The recreational improvements made in the park in the 1930’s “revealed that economic and social hard times did not cause an abandonment of imagination, humor, or fun.” As Decatur’s oldest planned public park, Delano Park continues its role as a space for all people to reconnect with one another and nature.